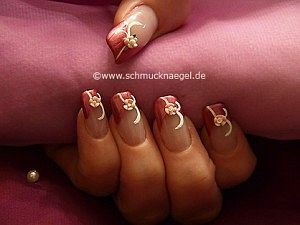 The variety of fingernail designs would be inconceivable without the extensive nail art accessories. 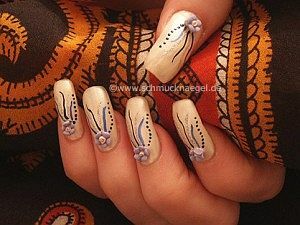 Decorated fingernails with nail art are nowadays very important for many woman and a great eyecatcher. They can be designed in many different ways and every motif is an individual piece of art. 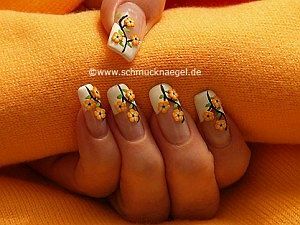 Because of the high amount of different nail art accessories, there are no limits to your creativity in creating simple or extravagant and unique fingernails motifs. They give the fingernails a elegant and noble touch. Hereinafter you find a small listing of useful nail art accessories. The nail art pen and nail art liner are indispensable products in creating different nail art motifs. 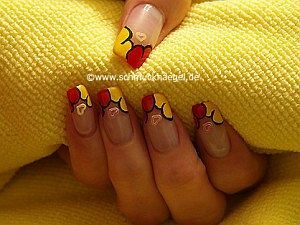 They enable you to create detailed motifs on the small surface of your natural or artificial nails. The nail art pen as well as the nail art liner are indispensable as nail art accessories and belong to the assortment of all fingernail designers. The nail art pen is an indispensable nail polish bottle with a brush for painting and a small tube with a needle-sized opening under the lid to draw fine dots or small leaves at the nail art. in red – Step by step instruction for a flower design. We hope that you liked! 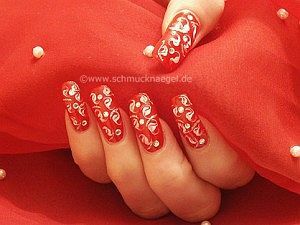 and strass stones in crystal – Step by step instruction for a party motif. 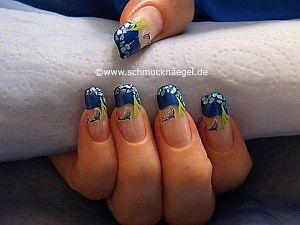 The nail art liner is filled with water-soluble acrylic paint. It has a very fine brush to draw thin, fine lines. 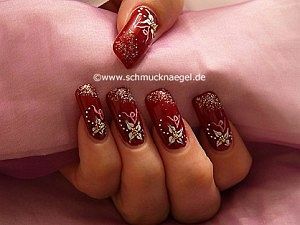 The nail art liner is also available with glitter varnish to create beautiful effects on the motif. Without certain tools for decorating the fingernails, it is more difficult and tedious to use certain working techniques. Hereafter we would like to introduce you to the spot-swirl and the flat brush for the one stroke technique. 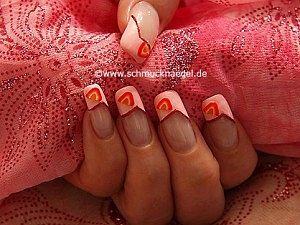 As nail art accessories both tools are very important working tools for all fingernail designers. The spot-swirl is ideal for the incorporation of rhinestones, bouillons, dried flowers, 3D figures etc. as well as for applying light-curing color gels. The spot-swirl is available with different ball heads and diameters for individual nail art creations. It is also very good for the marbling technique as well as for drawing an exact smile line with french gel. Design your nails with our nail art instruction. With step by step pictures to make yourself. The flat brush is ideal for one stroke technique of painting. 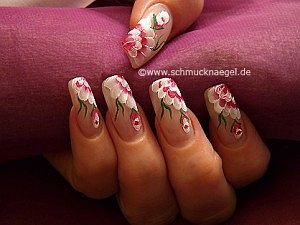 You can take with the flat brush several acrylic paints simultaneously to create floral motifs, leaves or other extravagant motifs on the fingernails. The flat brush or one stroke brush creates extraordinary and breathtaking artworks. 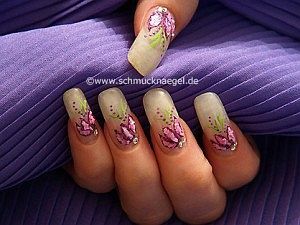 Nowadays the industry offers nail art products for decorating the fingernails in many different variants. 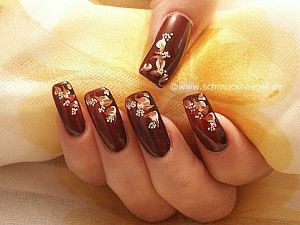 There are nail art accessories, fingernail stickers with various motifs, modeling materials called fimo, glitter powder and metallic foils as well as rhinestones in various colors, 3D ceramic flowers, half pearls as well as shell chippings and still much more to decorate the fingernails. We would like to introduce you to some of these nail art products and under “nail art instructions” you will also find many motifs that are illustrated and explained step by step. Just get ready! You will be amazed how quickly you learn the techniques and the handling of the nail art accessories from our instructions. Fimo is a modeling clay which is ideal for decorating. You can create very small motifs with this hardened mass, which you can use for nail art. You can attach it to the fingernails either with UV gel, tip glue or with clear lacquer. 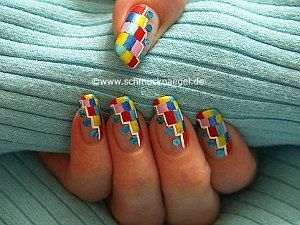 Nail art fimos are available in different shapes and colors. They are available as fimo flowers, leaves, stars, fruits or animals. You can buy them as a bar and then cut them into very thin slices with a special fimo blade, a carpet knife as well as a very sharp knife, or you can bought them already cutted, which is of course easier and the cuts are more precise. 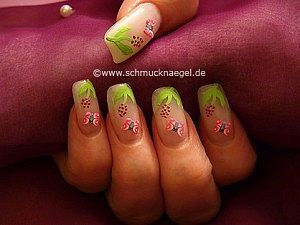 The fimo fruits give the fingernails a fruity sweet look especially in summer. 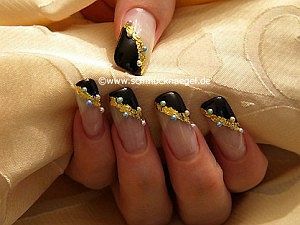 The beaten gold are thin gold leaflets for decorating the fingernails. You can pluck the gold leaflet apart with tweezers in small pieces and then place them on the wet nail polish or clear lacquer. The leaf gold is also offered already plucked in small bins. It gives your fingernails a touch of glamor and luxury especially at partys, weddings, on Christmas, New Year’s Eve or for a romantic date. 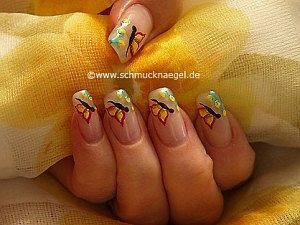 This nail art design is extraordinary and a great eyecatcher. and half pearls – Full cover party motif for autumn. We hope that you liked! 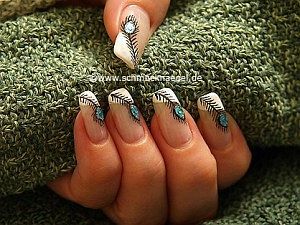 and nail art bouillons in silver and strass stones – Nail art step by step instruction. 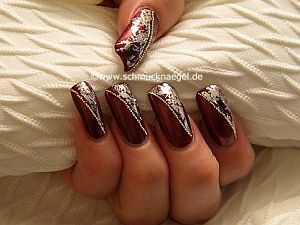 The metallic foils are fixed with a foil adhesive on the fingernail. The metallic foil is available in different colors and as a hologram. First, the metallic foil is cut to the desired length. Then apply a very thin layer of the foil adhesive on the fingernail. Now wait until the milky foil adhesive has changed to a clear color. Firmly press the metallic foil onto the surface and rub the spot with the spot-swirl or draw lines with it. After a short moment, the metallic foil can be removed. 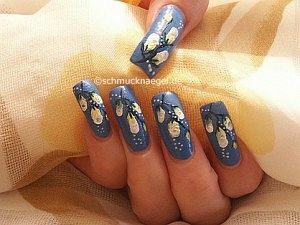 You can create unique beautiful motifs with them on your fingernails. The self-adhesive nail stickers are available in different colors and shapes, for example as holograms, flowers, borders, tribals, ornaments and many more. You can use them for natural nails and also artificial nails. To place them on the fingernail use a tweezers. and glitter-powder in pink – French summer instruction with pictures. The 3D flowers are made of ceramics. They are fixed with clear nail polish, nail glue or putted in the still wet UV gel. The dried flowers are real flowers, that has been dried. You can dry them by gathering some small flowers from a meadow and putting them between two pages of paper. 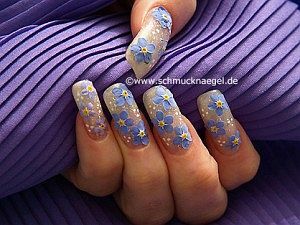 The dried flowers give the fingernails a fresh, light summery effect. The half pearls have a mother-of-pearl effect. They are available in different colors. They give the fingernails a beautiful and modern accent. 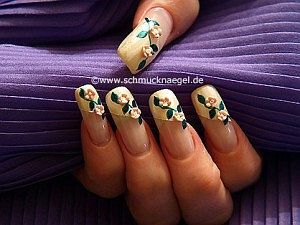 Like for example 3D ceramic flowers, the half pearls are also fixed with clear nail polish or nail glue or inserted into the UV gel which has not yet hardened. in silver – French flowers motif. The rhinestones are available in various colors and shapes like round, square, as drops, triangular, half-moon and in countless more shapes. They can be placed in the wet nail polish, clear nail polish or UV gel. 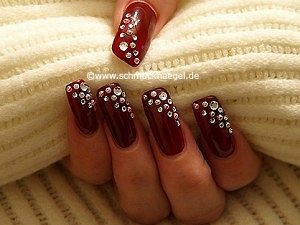 With rhinestones the fingernails sparkle and shine in the light. 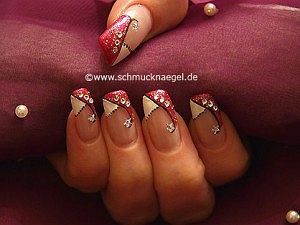 The rhinestones are indispensable as nail art accessories. 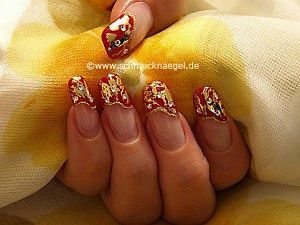 with nail polish in dark-red and strass stones in yellow and red. 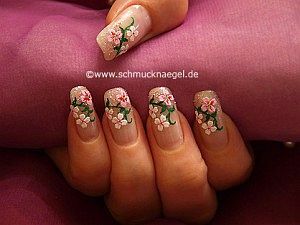 Nail art instruction with step by step pictures. We hope that you liked! 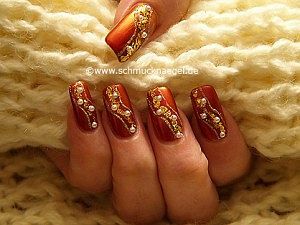 with gold.glitter and strass stones – French nail art instruction with step by step photos. We hope that you liked! The nail art pearl necklace is available in different colors. 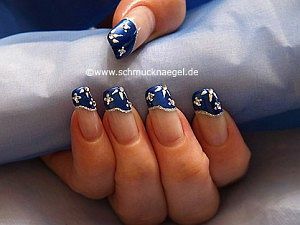 They belong to the 3D elements for the nail design and have a very noble and flashy effect on the motif. The pearl necklace can be shortened in the desired length. With the help of a tweezers it is placed on the wet nail polish, clear nail polish or in the uncured UV gel. The nail art pearl necklace sets beautiful accents on the fingernails. The glitter powder or glitter dust is very fine. It is available in countless colors. 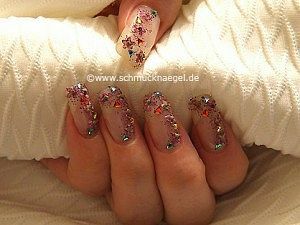 The glitter powder can be spread into the still wet nail polish, clear nail polish or uncured UV gel. It gives the fingernails a beautiful shine. The glitter powder should have everyone as nail art accessories. 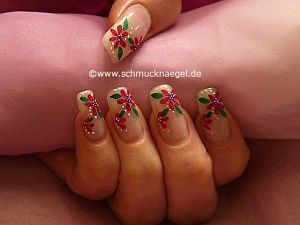 Summer party motif with nail tattoos and glitter-powder – Nail art step by step instruction with photos. We hope that you liked! The crushed shells are small chips from real or synthetic mussels. They are available in different colors and have a light mother-of-pearl effect. They are very thin and can be included very well in the wet nail polish, clear nail polish or in the uncured UV gel. 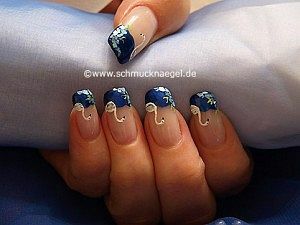 With their shining shimmer they give the fingernails a maritime appearance. – French animals summer motif – Step by step instruction. We hope that you liked! 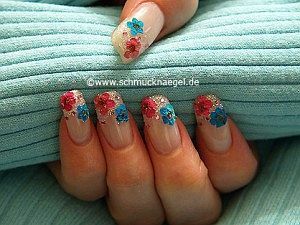 and strass stones – Flowers summer motif step by step guidance. The hologram motifs or nail art holograms are very thin iridescent inlay motifs. They shine and sparkle multicoloured in the light. You can take them with a tweezers and place them on the desired position. They are available in different colors and shapes for example as hearts, flowers, stars, half moons etc. – Valentine&apos;s Day decoration step by step instruction. We hope that you liked! 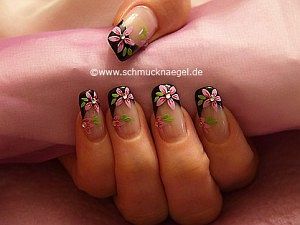 and nail art sticker – French flowers step by step instruction. We hope that you liked! in silver – Step by step French instruction with fotos. We hope that you liked! 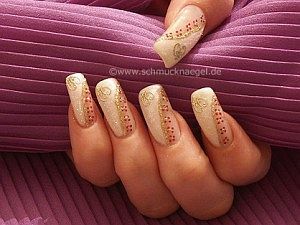 The sequins or nail art sequins belong to the inlay motifs. 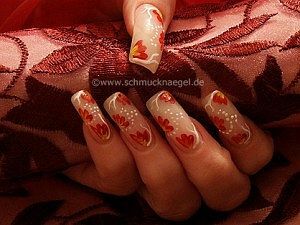 They are placed individually on the fingernails to set small accents. There are large and small sequins in different colors. The sequins give your nails the certain something and fit to every occasion. – French summer motif – Step by step nail art instruction. We hope that you liked! You can apply the micro pearls or nail art bouillons individually on the motif or cover the fingernail completely for the caviar effect. They are offered in different colors. 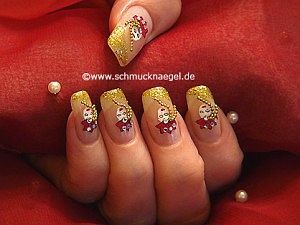 The micro pearls or nail art bouillons are placed in the wet clear nail polish, nail polish or UV gel. They put nice highlights on the fingernails and are another great way to create unique nail art designs. Nail art accessories was last modified: May 21st, 2018 by Make it Smart e.K.